A Hebden Bridge author and rambling enthusiast has written and illustrated a book detailing some of West Yorkshire’s moorland walks. Entitled The West Yorkshire Moors, the book is a hand-drawn guide to the county’s walking routes which were opened up with introduction of laws giving walkers the ‘right to roam’. Author Chris Goddard, 35, said: “The moors weren’t well-mapped so I started making sketches of landmarks. The maps show dozens of routes and feature illustrations of landmarks - each detailing the history and folklore of the area. Mr Goddard said: “It’s very easy to go out onto the moors and think that it’s empty, that it’s bleak, that there’s not a lot of interest - but when you explore the land and look into its history, it’s actually quite fascinating. Mr Goddard works as a footpath and trails surveyor.. He said: “I have walked all of the paths in Calderdale for the council. Mr Goddard has already started work on his next book mapping out the county’s ancient woodland. 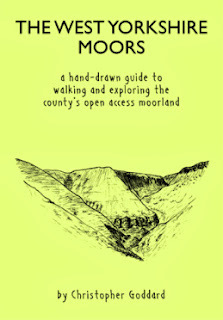 The West Yorkshire Moors is available in local bookshops. A map of Blake Moor details a local legend surrounding ‘The Two Lads’ - stone mounds balanced precariously on top of two similar sized boulders. Goddard recalled the story of two lads transporting milk across the moor in winter. As a storm hit, the boys took shelter behind the stones but perished in the cold. The stone cairns are believed to have been placed there in ancient times to commemorate the death of the two lads. Although the story of the Two Lads may be little more than a legend, the story has existed in the area for hundreds of years and found in antique journals. This article was originally published by the Halifax Courier on January 31, 2013.